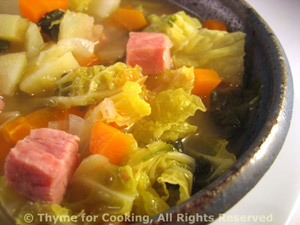 Easy Dinner from Thyme for Cooking: Ham and Cabbage Soup. I use 'ham base' to flavor this soup, which you can find in most US supermarkets'. I use it throughout the year in place of chicken stock for ham or bacon based dishes. I list chicken stock in the recipe because it's more readily available. Many vegetable soups use regular, white cabbage. I decided to make one featuring Savoy or green cabbage. With a slice of ham from the deli counter, this goes together quickly for a warming, winter meal. Stirring in a bit of cornstarch at the end gives the broth a more luscious 'mouth feel'. This is enough for 4 servings. Peel carrots; then slice by cutting in half the long way (in 2 or mores sections) then into half or quarter circles. Peel and slice potatoes to a similar size. Slice celery, cutting the wide end in half lengthwise. Remove dark green outer leaves from cabbage. Cut off a thick slice, avoiding the core. Lay flat, cut into 3 or 4 wedges, then thickly slice the wedges. Heat olive oil in a medium soup pot. Add onion and sauté until it starts to get tender, about 5 minutes. Add celery and sauté 5 minutes longer. Add ham and sauté briefly. Add carrots, potatoes, cabbage, herbs and stock. Cover and simmer until vegetables are tender, 30 - 40 minutes. Uncover soup and increase heat. When simmering hard, add cornstarch, stirring until it clears. Serve. 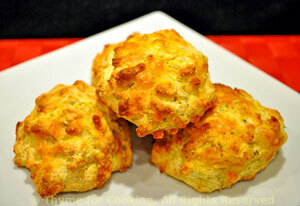 These are the easiest biscuits I've made - no kneading or rolling, just drop by the spoonful and bake! Combine everything except milk in a bowl and stir well to combine. Add milk and stir gently until just combined. Dividing the dough into 6ths, spoon onto nonstick or lightly greased baking sheet, 2 inches apart. Bake for 18 - 20 minutes at 400F (200C) oven or until lightly browned.